Obesity is deadlier and more pervasive than drug abuse. According to a new study from the McKinsey Global Institute, obesity costs the United States $663 billion in health care expenses, lost productivity and anti-obesity investments every year. 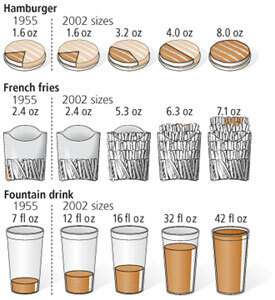 A record 63% of Americans are obese or overweight, a massive increase from 45% in 1980. Unhealthy foods, hectic work schedules, and sedentary lifestyles are clogging hearts and expanding waistlines across the country, with serious health consequences: Every year, obesity kills about 112,000 Americans. This is a crisis. More Americans are obese than are even smoking weed, the nation&apos;s controlled substance of choice. Only 38% of Americans have smoked pot. Harder drugs, like heroin, aren&apos;t in use among a large percentage of the population either. Instead of declaring war on obesity, the federal government is spending $13 billion every year, plus another $22 billion from the states, fighting the war on drugs. And it&apos;s losing. The rate at which people smoke, shoot and snort has gone virtually unchanged throughout the drug war, while drug overdoses are the leading cause of accidental death in the U.S. The U.S. only has 5% of the global population, yet it has 25% of the world&apos;s prisoners, with more than 2.4 million individuals currently behind bars. This is a 500% increase over the last 30 years. More than half of these inmates are serving time due to drug offenses. Why not spend that money fighting a different war — one on obesity? Despite the entirely negative impact of obesity on American society, there&apos;s still no such thing as a "Just say no to cheeseburgers" campaign. This trend is similar for other fast food outlets. The amount of calories in fast food is rising to the point where some meals (and even individual sandwiches) contain more than 2,000 calories. The government recommends that women in their 20s only take in 2,000 calories over the course of an entire day. If this trend continues, society will look like it does in WALL-E in two decades. Obesity can be beaten. The McKinsey study estimates defeating obesity would "require commitment from government, employers, educators, retailers, restaurants and food beverage manufacturers," but it didn&apos;t say it was impossible. Decreasing portion sizes in stores and restaurants, changing the chemical formulas of processed foods, weight-management programs at work and reducing the availability of unhealthy foods were all cited in the report as viable and potent solutions to the obesity epidemic. These solutions will have to be focused in the proper areas. Poor people are more likely to be overweight due to a phenomenon known as "food deserts" — places in which nutritious food cannot be obtained easily, if at all. When a liquor store, a 7-11 and a Burger King are the only options in town, obesity will skyrocket. What&apos;s worse is that poor people often don&apos;t have the time to exercise due to long hours and general economic uncertainty. People want to be healthy, it&apos;s just that our current lifestyles make that difficult to do. Rather than spend billions on a war that we&apos;ve already lost, America needs to start saving lives the best way it can: by taking the battle from the border to our waistlines.